DC’s "Little Rome" is awash in Catholic churches and sites, plus a lively arts zone and charming, bungalow-filled streets. Home to the Catholic University of America since 1887, the Northeast neighborhood of Brookland has developed into a church, chapel and monastery-filled zone nicknamed "Little Rome." But the popular neighborhood is also home to tree-lined streets filled with older homes and retro storefronts, and its central arts zone near the Brookland Metro stop offers galleries and performance spaces. Catholic University’s 193 tree-lined acres include Romanesque stone buildings and a grassy central lawn popular for sunbathing and frisbee. It’s just across the way from the impressive, domed Basilica of the National Shrine of the Immaculate Conception. It’s the largest Roman Catholic Church in North America, and one of the largest churches in the world. Guided or self-guided tours of the massive edifice, which is dedicated to the Virgin Mary, take in numerous shrines to her and a three-story high mosaic portrait of Jesus. You can also tour the peaceful Franciscan Monastery of the Holy Land of America, which was founded by friars in 1899. The Byzantine-style Church of Mount Saint Sepulchre is surrounded by cloisters, a garden with hundreds of roses and replicas of Holy Land shrines like the Grotto of Lourdes. Take a guided tour of the grounds or the church’s interior, where brown-robed monks lead you through the upper church as well into the crypt, with more Holy Land replicas and religious relics. Visitors to Saint John Paul II National Shrine will encounter the life and legacy of Pope John Paul II through a ten-gallery exhibit featuring personal artifacts, videos and interactive displays. Mass is offered daily in the Redemptor Hominis Church and the Luminous Mysteries Chapel displays a first-class relic of John Paul II. Both spaces are adorned with gorgeous mosaics that provide an opportunity for prayer and reflection. This vibrant collegiate area moves to a creative beat, which you’ll see in action on the Arts Walk at Monroe Street Market. The galleries of local potters, painters and crafters line a brick-paved pedestrian byway; visit when they’re open (most weekends) and you can see them in action and buy their wares; think carved wooden busts, pillows decked with vintage souvenir pennants and paintings galore. Nearby, long-running Dance Place offers up 100-plus performances a year starring edgy contemporary choreography. You might catch a South American salsa troupe or local modern dancers. Dining and drinking spots also dot the area, with offerings on old-timey 12th Street NE like funky gastropub Smith Public Trust (don’t miss its good-weather beer garden) and Steel Plate, which dishes up fancy cocktail and new American chow in a space decked with reclaimed wood and brassy light fixtures. No visit to the neighborhood is complete without a visit to Right Proper Brewing Company's Brookland Tasting Room, which offers free tours on weekends and pours from 12 taps. 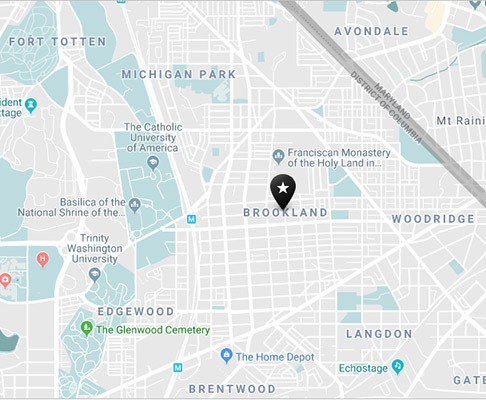 Continue your brew-centric visit on the Arts Walk, where Brookland Pint serves dozens of beers (including two dozen mostly local ones) in cool surrounds with a mural of the monuments and the National Shrine; a pubby food menu is on tap too. Neapolitan pies at Menomale, outdoor festivals on the Arts Walk, getting here by bike via the Metropolitan Branch trail. Metro’s Red Line stops here at the Brookland station. The area is also located just off of the Metropolitan Branch biking and walking trail. From an up-and-coming arts district to plenty of recreational greenspace and "Little Rome," discover all that Brookland has to offer.